An easy pie crust recipe should be part of every cooks repertoire. Having homemade frozen pie crust on hand is great for quick pies and quiches. This recipes makes one 10 inch pie crust, double it for a top and bottom crust. Use a food processor to make this really fast and keep the dough cold. Working it by hand warms up the butter and makes it melt leading to a crust that isn’t as flaky. Cut the butter into cubes and add it to the food processor with the flour and salt. Pulse until the mixture is crumbly and well incorporated. Add the water one tablespoon (15 ml) at a time while pulsing. As soon as the dough comes together stop adding water. If you do have to work by hand use a pastry cutter or fork to combine the butter with the flour and salt. Try not to over mix the dough when adding the water. You can roll dough before of after freezing. I usually don’t wait for the dough to rest or chill, it rolls just fine after being mixed. Quick Tip: Roll your crust on top of parchment paper. Lift the paper and slide off the crust or peel back the parchment to easily get your pie crust from the counter to the pan. Try using shortening instead of butter or use some of both, just keep the same amount of fat (butter/shortening) as the original recipe. Try different flours from white to wheat, some people even substitute in some ground nuts. Consider adding just a touch of spices to your crust, a sprinkle of cinnamon for example can spice up the crust for a fruit pie. Shape the dough into a small dish about the size of a round dessert plate and freeze. This shape helps the dough thaw fast and makes it easy to roll when thawed. I usually don’t roll my dough first because it takes more space in the freezer but it does save some time and mess when you go to use it. Remember to label, date and add the crust to your freezer inventory sheet including any variations you added. Thaw at room temperature a couple hours or in the fridge overnight. 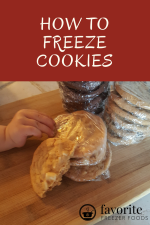 Homemade frozen pie crusts can give you the same benefits of store bought crusts, they are really easy to make ahead and save a ton of money. The most time consuming part of homemade pie crust, once you get used to rolling your dough is cutting in the butter by hand or washing the food processor so you might as well double or triple the recipe every time you make crust and freeze the extras. 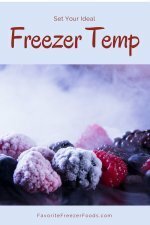 Learn more about freezing breads and baked goods. Got questions? Ask me your freezer cooking questions. Return from Easy Pie Crust Recipe to the homepage of Favorite Freezer Foods.